My interest in design and architecture is for the most part all thanks to Roman Mars’ 99% invisible podcast. The ability to articulate beauty, redefining beauty and seeing it differently as well as understanding why it matters. I’m giving you this back story because it informs all the feelings I had and thoughts I felt when I saw the Taj Mahal and learned about its architectural design. The amount of care and thought that went into the design of the Taj, is incredible. The Taj Mahal was commissioned by Shah Jahan in 1631, to be built in the memory of his wife Mumtaz Mahal, a Persian princess who died giving birth to their 14th child, Gauhara Begum. 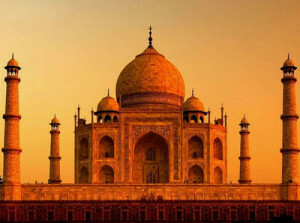 The imperial court documenting Shah Jahan's grief after the death of Mumtaz Mahal illustrate the love story held as the inspiration for Taj Mahal. If you look around the world, you will notice that most traditions have quite elaborate burial rituals. I often wondered why we’re drawn to extravagance when we are grieving. I once asked artist Clive Van de Berg about this very topic after seeing his work ‘in memoriam, they threw him’. He explained this phenomenon as ‘redemptive beauty’. When we have lost something we love and we are grieving, we require rituals that will fill the emptiness and bring meaning back to life. This is how and why most artist create, using beauty to heal. Knowing that the work is done once that feeling of needing to do something has been fulfilled. 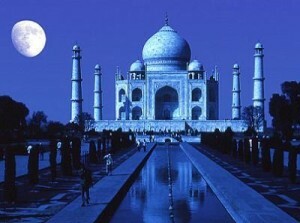 Taj Mal, is in that sense, the ultimate display of the process of redemptive beauty. Instead of having the Mausoleum in the middle of the garden with the four streams of milk, honey, water and wine as in the Islam depiction of paradise, the Taj was built at the end of the garden. This meant that there would never be any object (tree, etc.) behind it, that would obstruct the clean view of seeing the ivory white marble structure against the backdrop of the sky. Because of this clean view, the Mausoleum changes color depending on the time of day as it reflects light. 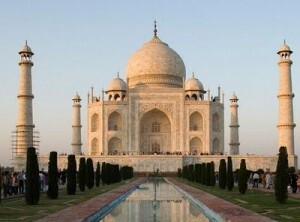 At sunrise the Taj exudes grey and pinking tones, while at noon it is pure and clear white. At sunset the mausoleum takes on a striking orange tones while at midnight it is rhapsodic in its striking shade of blue. To keep the integrity of the Taj Mahal maintaining its appearance of a painting, the architect built 4 columns around it. The columns are built at a slightly tilted angle so that the eye can perceive them to be straight. If they were in fact straight, they would be distorted as the lens of the human eye is a convex lens. As if the engineering of the structure is not impressive enough, years where spent on the exterior. All the calligraphy around the Taj was carved by creating small cavities in the marble and filling them with natural semi precious stones to get the different colors. 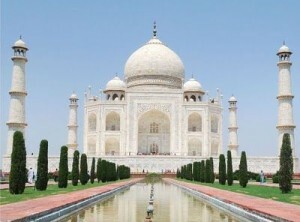 The exterior decorations of the Taj Mahal are among the finest in Mughal architecture. As the surface area changes, the decorations are refined proportionally. The calligraphy on the Great Gate reads "O Soul, thou art at rest. Return to the Lord at peace with Him, and He at peace with you. Taj Mahal, Crown of the Palace: colour, texture, design, imagination, human accomplishment…..it’s all there, it’s beautiful and its redemptive.